This month, we featured a wide variety of styles, a lot of which are fruit infused. They're all sessionable, yet all extremely delicious on their own. 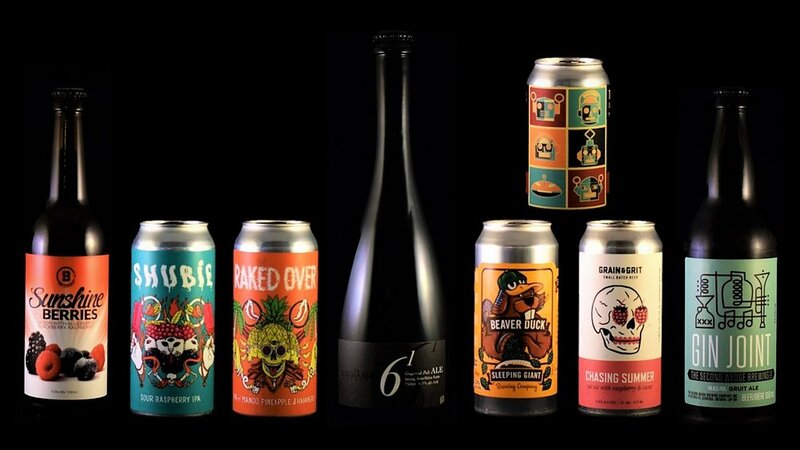 7 unique breweries, 5 different formats, 8 unique beers totaling 4147ml of beautiful beer. A brett-fermented saison with a huge amount of raspberry, blueberry and blackberry. A slight tartness and a wonderful finish. Fruit salad in a glass. This unfiltered and dry hopped Pale Ale has a citrusy aroma of tangerine and pine with a clean finish. Beaver Duck is an APA with distinctive hoppiness (Centennial, Galaxy, Amarillo), without the bitterness. A grapefruit infused pale ale, dry-hopped with Galaxy. The combination of the already grapefruit tasting Galaxy hops and grapefruit puree make this pale ale feel like you're drinking a glass of juice. Drink Fresh. Hang ten with this juicy hop forward IPA with loads of citrus hop notes upfront, juicy pineapple and mango flavours, and a spicy habanero kick. Jump on board with this Sour Raspberry IPA! This tasty summer IPA brings together juicy hop flavours with tart sour notes and a tidal wave of fresh raspberries. Brewed with raspberry, cacao & 30% oats. Bubble gum, raspberry & floral aroma. Slightly tart, sweet & bitter chocolate flavour. Soft, creamy mouth feel. Pleasantly fruity, extremely drinkable and remarkably complex, this green tea infused ale showcases a myriad of rich flavours. New world hops add a bitter and citrusy punch, only to part and reveal a bright blast of strawberry and finishing with a lasting green tea backbone. Ingredients: Water, malted barley, malted wheats, oats, hops, strawberry puree, green tea. Inspired by the botanicals in our favourite cocktail spirit, Gin Joint sparkles with a bright and aromatic blend of juniper, angelica root, cassia, orange peel, coriander and cardamom. You can create a gin & tonic with gin joint, tonic water, and some lime! Use about 65% Gin Joint and 35% Tonic water.